CHANDIGARH: A Pakistani Smuggler was killed while another was caught on Saturday as BSF jawans thwarted an attempt to smuggle in heroin into the country through the Abohar sector in Punjab. A pistol (7.63mm), two magazines, seven rounds and eight packets (nine kg) of heroin were recovered during searches near the Border Out Post Jagannath, BSF official said today. 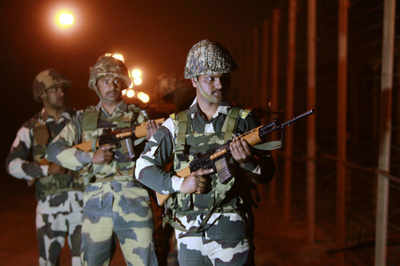 The operation was launched after Bsf Troops noticed suspected movements near border fence laat night. An official said BSF troops challenged Pakistani smugglers as they tried to approach the border security fence to smuggle in the contraband. But the suspects opened fire at them which was retaliated by the jawans, he said. In the exchange of fire, one smuggler sustained bullet injuries on the right leg while the other managed to escape towards Pakistani side taking advantage of darkness, the official said. During searches, BSF troops apprehended one injured smuggler along with arms and heroin, he said. In the morning, BSF jawans observed the body of another smuggler was being taken away by the Pakistani Rangers. The smuggler was hit by bullets while crossing back to the Pakistani side, the BSF official said.